MAJR Products offers EMI/RFI Shielded Ventilation Panels; EMI/RFI Shielded Honeycomb Ventilation Panels, EMI/RFI Shielded Air Filtration Panels, Honeycomb Waveguides and EMI/RFI Shielded Fan Ventilation Panels for common or standard fan sizes for the electronics industry. MAJR has excellent in-house metal working capabilities, as well as capacity. While the rigid frame provides a stable method of holding and installing gasketing the other three provide for air flow, dust and particle filtration while attenuating EMI (electromagnetic) or RFI (radio frequency) waves present in the electronic device or posing a possible threat to the device. Honeycomb Ventilation Panels provide optimum electromagnetic/radio frequency interference (EMI/RFI) shielding with minimum pressure drop while ventilating air. Shielding effectiveness is accomplished using waveguide design principles. Fan Ventilation Panels are manufactured to meet the commercial market’s requirements for a low-cost, high-quality electromagnetic/radio frequency shielded ventilation panel. These units are available in five standard sizes using a 0.250″ thick honeycomb material and have an overall thickness with gasket of 0.407″. 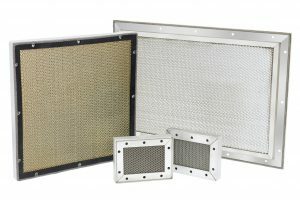 Shielded Air Filtration Panels filter the intake air of electronic equipment where electromagnetic/radio frequency interference (EMI/RFI) shielding is a criteria. Our filter media can be supplied as either dry or oil coated. Impingement of fine dust particles on filters with a glutinous oil coating is greatly enhanced. Honeycomb Waveguide Panels special design lets air flow into and out of an EMI/RFI shielded enclosure. This feature allows for the cooling of electronics as well as air circulation for manned military shelters as well as electronic boxes and cabinets.